The County Tennis Club of Westchester was built in 1912 to encourage people to buy homes in a new development called Greenacres, and was run as a private membership club. In the 1920s, the Club was acquired by what became the Bronx River Parkway Commission, part of Westchester County government. The County leased the property to County, which continued to run it as a private club. 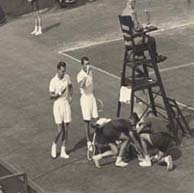 When I joined County in 1955, one had to be a “good tennis player” (or know somebody) to be admitted. Truth be told, I knew the Club treasurer and the team captain, so I got in. Back then, County had the best tennis in the entire Metropolitan area, a 10-year waiting list, and everyone wore traditional tennis whites. In the 1980s, a court case involving a hangar at Westchester Airport led to a decision that public lands could not be used for private purposes. Westchester County told the Club it would continue the lease but on new conditions: all members had to reside in Westchester, and people would have to be admitted on a first-come, first-served basis. A few years later, as membership declined, the County agreed that members from outside Westchester could again be admitted. When I joined, all the courts were red clay. Six courts were soon converted to Har-Tru, although some members wanted all to be converted. 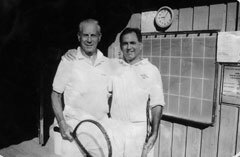 Bill Greenawalt, whose father Kenneth was Club president 1953-54, told me that as a boy he played barefoot on the clay, and that he remembers linesmen and ball boys at championship matches. Bill, who followed in his father’s footsteps by serving as president 1979-80, also recalls a piano in the clubhouse and a working paddlewheel in the river. The Club’s one tragedy was the arson of the historic two-story clubhouse the same night nearby Hitchcock Church was set afire. With the help of member/architect Sy Breines, the clubhouse was rebuilt. County has been fortunate to have great members and the stability of long-serving pros including Frank Brennan, who went on to legendary status as the architect of the women’s tennis program at Stanford University and the coach of Billie Jean King, and since 1963, Bob Frey, now in his 38th year with us. All in all, our historic club, built 15 years before the oldest parkway in America would run past its courts, is looking very good indeed as its nears its centennial. Most import is that because the Club was on County land, there could be no discrimination as to religion, race or color. From its origin, County was the only club in the area with an “open membership” policy. My late wife Faith and I moved to the Fox Meadow area in the fall of 1952, as did many of the World War II era. We first made tennis friends at the Brite Avenue courts, and grew those friendships at County. 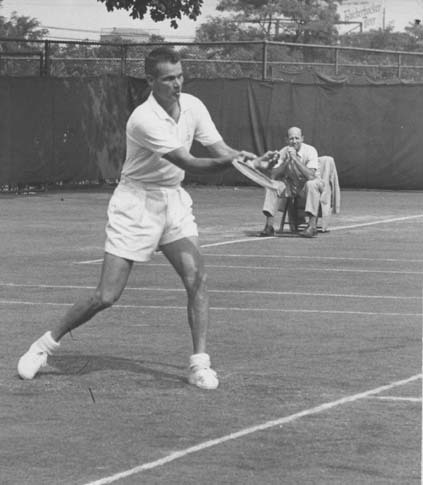 In 1953, I played in the State clay court singles tournament at County, advancing to the second round (after a default) where I lost in three sets on Court 1. The tournament winner, as I recall, was a top 10 U.S. player from New Jersey. Other tournaments were held at County back then: Bobby Riggs won an event, and players often came to practice on our red clay before leaving for Paris and Roland Garros. 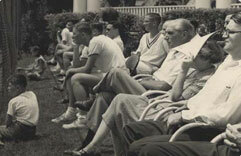 Later, when I was president and for some years afterward, regional senior events were held at the Club. Back then, we were very social, with parties and dances, often with live music. We had fun on and off the courts with our County friends with special events on Memorial Day, the 4th of July and Labor Day, and a well-attended mid-winter dinner at a local restaurant. We also had a strong junior program run by Lois Steckler, wife of Phil Steckler, who with Bill Adolph formed a highly ranked senior doubles teams in the 1960’s. My son Ed came through that program and went on to captain the Scarsdale High team and then play for the University of Michigan. In 1985, the last year of my presidency, the Clubhouse burned to its foundation, with only the fireplace left standing . . . a lasting memorial to those who have come to and played at County for nearly 100 years. As that tragedy struck, we asked fellow member and noted architect Sy Breines to design a new Clubhouse. Donating his time and talents, Sy was on-site virtually every day to direct rebuilding activities. In a very important Board meeting, former Club President Max Kahn made an impassioned plea, and the necessary funds were raised by assessment to build the “new” Clubhouse more than 25 years ago. If not for Sy and Max, who knows if County would still be around and be the great Club it is today. Herb is no longer with us, yet his words remain true and we were grateful to have him as a longtime member.